On September 11, Canyon Heights Academy students, faculty and parents gathered in the cafeteria for a special assembly to remember the 14th anniversary of 9/11 and what it means to the history of our country. They paid tribute to our local first responders, including members of the Campbell police and fire-fighter units, as well as parents who are first-responders. These men and women risk their lives each day to help others and keep us safe. Dr. Margaret Richardson, Head of School, opened the assembly and welcomed everyone. Everyone join in reciting the Pledge of Allegiance, and the Cardinal choir beautifully sang the Star-Spangled Banner under the leadership of choir director Ms. Judaline Swinkels. Fr. Anthony Sortino, assistant Chaplain for Canyon Heights, shared memories of what it was like to be in New York City on 9/11 and in the days following. Dr. Richardson also discussed the importance and appreciation of all First Responders whether they are EMT, paramedics, police officers, fire fighters, homeland security officers, etc. 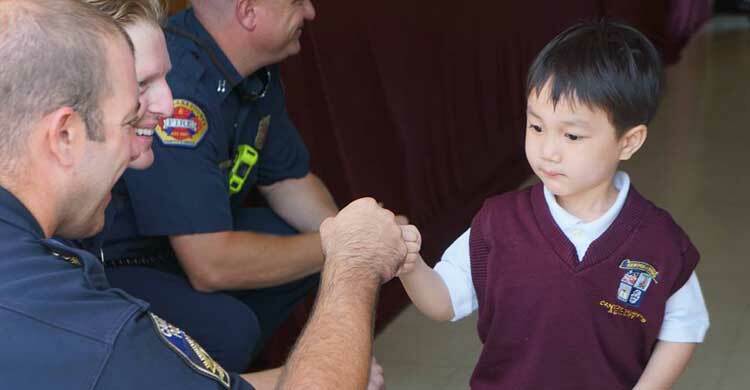 Afterwards, students exited the assembly giving a “fist bump” and thank you to the First Responders. Students and parents were also able to view both a fire truck and police motorcycle with the officers. Never forget. God bless America!